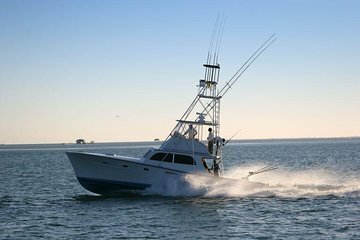 Experience deep sea fishing in the Caribbean Sea on this private fishing charter from Playa del Carmen. Enjoy a completely personalized experience aboard a Boston Whaler sportfishing boat with an experienced crew, top-of-the-line equipment, and GPS fishfinder. Depending on your preferences, try your luck fishing for snappers and roosterfish closer to shore, or head out to deeper waters to fish for tuna, mahi mahi, and marlin.